Title: NS Rebuilt Leads H65 @ 1059 hrs. Title: Park Place East & Blum Blvd. Description: Here, the train heads down the Seamans Lead towards customers on the other side of Berrys Creek. Description: The coaches have been pulled out from the track in the lower left of the photo, pulled onto the track you see them on, and now The NS H-08 crew is running around the train. Title: Smokin it up outta Town! Description: NS H-08 pulls hard east towards Campbell Hall. Description: Air Products train 053 passes through the S-curve in Stanton Station at 2:06PM. Description: 053 heads over the crossing with two GP38-2's pulling a heat exchanger. Description: The NS HC10 on the wye at West End on the way to Mid-Atlantic. 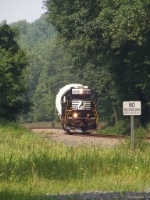 Description: The NS HC60 drilling Belden Brick in Saddle Brook, NJ off of New Jersey Transit's Bergen County Line. Description: NS HC60 working at Belden Brick in Saddle Brook, NJ. Description: The NS HC60 prepares to depart Suffern with 25 cars as the Suffern local power idles away on the adjacent track. Description: Spotting the Ringling Brothers and Barnum & Bailey Circus Train coaches in Croxton Yard. Description: After making the first cut, the next cut of coaches are backed into place on an adjacent track. Description: The circus train power pulls up and awaits a signal to depart for the Pascack Valley Line. Description: The 138th Edition Ringling Brothers and Barnum & Bailey Circus Blue Train rounds the curve between Pascack Junction and Union Avenue. Description: The 138th Edition of the Ringling Brothers and Barnum & Bailey Circus Train pulls up the Long Siding on the Pascack Valley Line. Description: Crossing Berry Avenue with the four stock cars. Description: A Croxton Yard crew starts to breakdown the circus train with three GP38-2 rebuilds for power. Description: Pulling up to NJT's ex-Harmon Cove station to await clearance on NJT. Description: NS GP38-2 rebuilds 5618, 5615 & 5614 are assigned to bring the circus train out to NJT's Pascack Valley Line. Description: NS crew with some of the RBB&B Blue Unit cars awaiting clearance onto NJT's Pascack Valley Line. Description: With their cars for the Pascack Valley Line ready, the NS crew awaits clearance onto NJT. Description: A side view of NS GP38-2 5618. Description: Handing off Ridgefield auto racks to a Conrail crew.